The headlines have been particularly ugly, but they are not even close to the horror that lies within the articles. The ugly news comes out of the Central African Republic, a landlocked but resource-rich African nation that is--despite its mineral riches--crushingly, desperately poor. 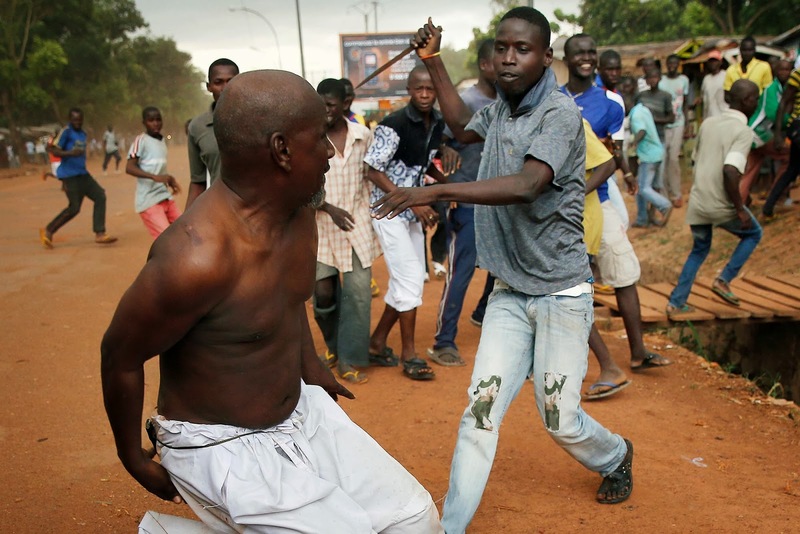 After an armed Islamic movement from the north overthrew the government and installed their own leader, the country has been trapped in a cycle of violence and retribution. The conflict between the Muslim community in the North and the majority Christian communities of the South is spiraling out of control. Most headlines articulate this as a war between faith traditions. Islam and Christianity at war! It's typically brutal stuff, so much so that it's easy to either turn away or tune it out, but one story really stuck with me. It involved a single death, that of an unarmed Christian man who wandered into the wrong neighborhood. He was killed by an angry mob, one that had, in the manner of mobs, become convinced that he was carrying grenades to attack a nearby mosque. He wasn't, of course, but that made little difference. He was hacked with machetes, and his throat was cut, and then he was hacked at some more. Then his mutilated remains were dumped near a Red Cross base. “All the Muslims will die in the country,” vowed one woman, shrieking loudly. That last statement just stuck with me, particularly given the assumption that this is primarily Christian/Muslim conflict. When an angry, frightened human being screams such a thing, where does it come from? A conflict between competing faith claims? Is this a statement that reflects an interfaith disagreement? I cannot see it as such, at least not from my side of the fence. Rage at the loss of a neighbor and friend will stir such a reaction. It's human. If one of my friends or one of my children had been killed, I'd feel it too. I'm not sure about the eating part, but rage does all manner of disproportionately horrible things to the object of a violent intention. But as a reaction, the yearning for revenge is not a Christian yearning. Oh, sure, Christianity has been used to justify all manner of terrible things. Amazing, how easily a tradition can be warped. At the heart of our faith, though, there is no justification for retributive violence against an enemy. It is radically antithetical to everything we believe. One can bend and warp what Jesus taught to legitimize vengeance or violent coercion, sure. Or that sense of Christian identity can just be washed away in the blood-red fury that we feel when "we" are threatened, as a family, a tribe, or a nation. But that reaction, very human, very primal, is decoupled from the teachings of Jesus in such a radical way that describing it as "Christian" seems fundamentally inaccurate. It finds no foundation there. Its heart lies more in the claims that power has over us.